Lisfranc injuries should be suspected in patients who complain of midfoot pain and swelling after any trauma. One or more of the rays may appear short. As they are often missed initially, they should be specifically looked for in multiply injured patients at the secondary survey. Examination should include the proximal tarsus also. Patients with such an injury should be checked for injury to the deep peroneal nerve, dorsalis pedis artery and compartment syndrome. AP, lateral and oblique radiographs are required. The degree of dorsal or plantar displacement may be apparent only on the lateral film. CT may be useful to assess more complex injuries and Lu et al (1997) showed that CT is better than plain radiography on assessing minor incongruity. Sherief (2007) tested a group of orthopaedic surgeons, radiologists and emergency medicine doctors with 30 foot images, 18 of which included Lisfranc injuries. Histories were supplied. 11/18 (61%) were detected by all readers. A subtle Lisfranc injury in a neuropathic foot was missed by 8/9 readers and a subtle divergent Lisfranc injury with a "fleck sign" by 5/9 readers. 3/9 readers were distracted by the presence of Freiberg's disease in another film. Overall the rate of missed Lisfranc injury was 19%. On the plain film fractures and malalignment and displacement of the metatarsals relative to the cuboid may be apparent. More subtle injuries may be picked up by measuring the distance between the first and second metatarsal bases (<2mm), looking at the alignment of the lateral aspect of the second metatarsal base with the intermediate cuneiform and looking for the “fleck sign”, an avulsion fracture of the medial base of the second metatarsal by the Lisfranc ligament. If a subtle Lisfranc injury is suspected but not seen on plain radiographs, a weightbearing film may show malalignment. 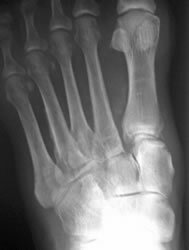 Timpone (2009) described a "fat pad sign" on plain radiographs between the first and second metatarsals in a single patient with a subtle Lisfranc injury. Raikin (2009) described the accuracy of MRI in evaluating subtle Lisfranc injuries. MRI was performed on 21 patients with a pure ligament injury suggestive of a Lisfranc joint injury, and reported blindly by a musculoskeletal radiologist. The results were compared by the findings of stress radiography and/or surgical exploration. The most predictive finding was disruption of the Lisfranc ligament - sensitivity was 94%, specificity 75% and positive predictive value 94%.